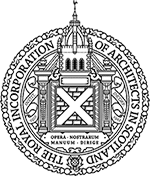 The Stirling Society of Architects (SSA) is one of the six chapters of the Royal Incorporation of Architects in Scotland (RIAS). We represent the Architects working or living in Stirling, Falkirk and Clackmannanshire. The SSA is here to help and wishes to actively engage with clients, practices, architects, and the general public throughout the Forth Valley area. We hope that this website will be a significant step towards that ambition. Please have a browse through our online directory of Chartered Architects where our members demonstrate a broad depth of design skills combined with local experience. The ability of members in the Chapter area (and in other areas) is extensive, with individuals and practices available to handle all project types from the smallest domestic extensions to the most prestigious of commercial or public buildings. Because our members live and work in the Chapter area they know well the Planning and Public Authorities with which detailed liaison is required to bring building projects from conception to successful completion; they understand the local issues involved; and – crucially – are locally based and therefore on hand and available to ensure that your projects are successfully delivered.